This is a screenshot showing two images- Mozilla with SILA and Mozilla without SILA. It is taken when we view the Bible Gen Chapter 37 in Burkinafaso language. Look at those characters which have more than one accents mark. That show the difference about SILA. Sharon_Correll@sil.org gave me work-in-progress version of Burmese font and some sample Burmese text. The font is not finallized so it is not public available now so other people cannot test it. People who work for sil.org probably can get an internal version and test with it once we release a test version of SILA. 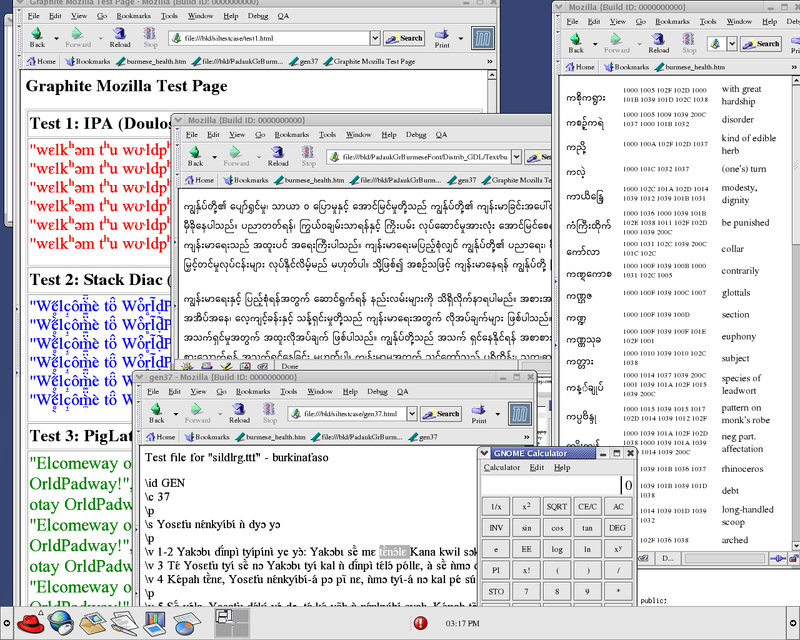 The following screen shot is taken with viewing that UTF-8 encoded Burmese text file with unmodified Netscape7 and [12/1/2002] SILA with with "View:Text Zoom (300%)". The first screen shot is taken from unmodified Netscape7, you can see the text are render as the isolate shape which is incorrect. 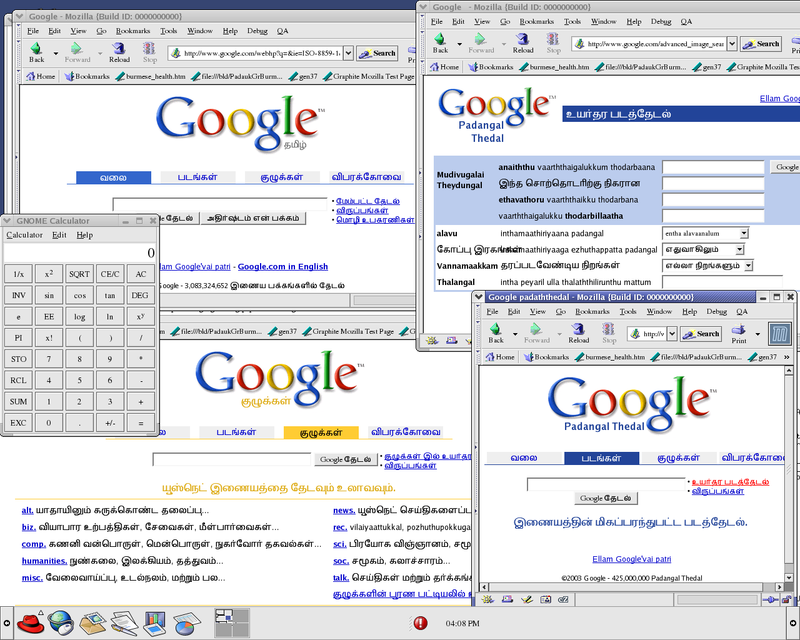 The second screen shot are taken from the SILA. You can see the glyph are composed together. Since I don't know Burmese personally, I only can compare the rendering result with WorldPad and make sure SIAL be have the same as WorldPad and depend on the Graphtie QA to ensure the qaulity of Graphite itself. 1. Baseline is wrong: somehow the Y position is wrong in the PigLatin display. It look the baseline is too low in this screenshot. All the text should fit into the color area. 2. Line Height is wrong. 3. Also the position of the mark on top of the "o" and "a" of "WorldPad" are strange. We solve the first two issues in 12/7/2002. Now, only the 3rd issue is still there. We learned the 3rd issue is caused by lacking some entries in the font's 'cmap'. It is a bug in the font, not a bug in SILA, mozilla, nor Graphtie. Notice that some text on the html are not display as Pig Latin, that is because the page specify the font-family in CSS or using <font FACE=""> for those text to overwrite the pref setting. The sila project can be contacted through the mailing list or the member list.